As autumn leaves are starting to redecorate the streets at the northern hemispshere, can't help but need an extra something over my shoulders...what should that be? Oh every day life decisions can be tricky! And I don't need to put another one on my mind when taking off in a hurry to start the day. Levi Strauss and Jacob Davis had such a revelation when they chose the denim material to create their pants. A material so strong and versatile - literally and figuratively - that has become part of our culture. So behold the denim jacket! Steady companion to every outfit. You can either choose to wear it as part of layering overcoats on a cold day or topping a floral dress on a warmer one. Even the denim suit idea sounds appealing if paired with matching shade pants or skirt. I acquired my vintage version of it from my husband’s closet. Classic blue denim shade and rather spacy - it even tops over my fluffier woolen sweater! 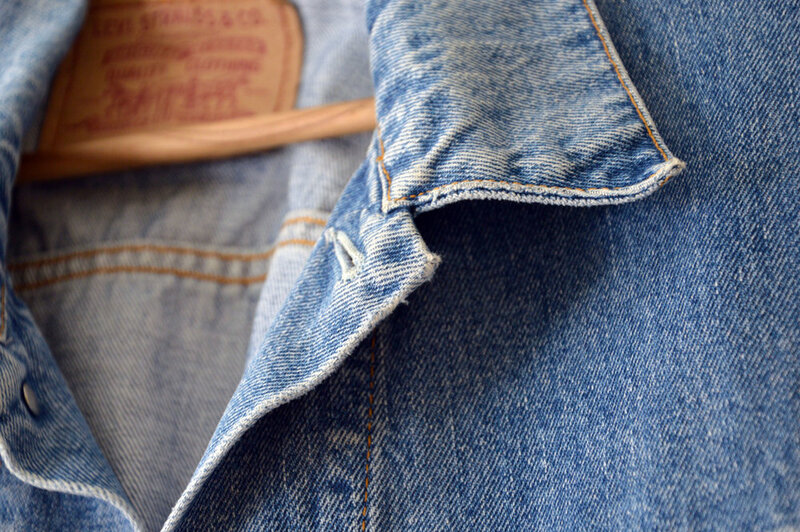 I encourage you to search for your version at vintage and thrift stores which are full of denim gems. Maybe I should do a little investigation on that matter? If you have any suggestions, please drop them below!